wedding dresses are often made from the conventional chiffon and lace wedding dress fabrics. Weddings don’t always have to be a formal affair. Nowadays, casual wedding dresses and informal wedding dresses is the new chic and whether you are hosting your wedding at the beach or at a farm, casual wedding dresses can really help to elevate the event and make you look amazing on the most important day of your life. If you are looking for a cheap wedding dress that offers you the perfect blend of casual elegance and looks chic as well, our collection of informal wedding dresses will help you find the best dress to make you shine. Our wide range of casual wedding dresses provides you a wide array of elegant wedding dresses made in a large variety of materials to suit your tastes. 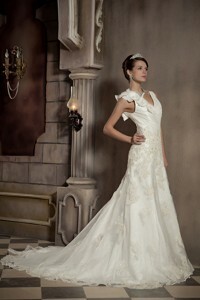 Whether you prefer silk, satin, taffeta or chiffon, you can easily find a gown which is perfectly suited to your choice. You can also choose from a wide array of white and ivory tones that will flatter your skin tone and help to make any bride look amazing in these wedding gowns. Our range of casual wedding dresses comes in a wide variety of styles that give the perfect balance between something ultra chic in the latest styles with the best embellishments possible. Whether you want a plain gown, sweetheart neckline, one-shoulder, A-line, empire waist, ruching, fitting, tucking, pleating or lace appliqués and beading, you can be sure to find those and more in our collection of perfect wedding dresses. At budget-friendly prices, you can pick the best style suited to your tastes and the kind of wedding you have in mind as well.